This book was a pleasant surprise. I've never loved niche cookbooks, nor am I a person who loves cookie dough so much as to make it just to eat on its own. But this was a cookbook that I happily read cover to cover, and it actually made me excited to get into the kitchen to make my own edible cookie dough. If you can make homemade cookies, you can make your own edible cookie dough, which is basically just a blend of butter, flour, and sugar with various mix-ins. Olivia Hops teaches you how to make it the safe way, without butter and with heat-treated flour. The recipes include classic flavors, such as chocolate chip, peanut butter, oatmeal, and birthday cake. Everything you'd expect a cookie dough bar to offer. But there are also intriguing and unusual flavors such as white chocolate chai, mango tajin, lemon cardamom, and strawberry coconut daiquiri. There's a flavor for even the pickiest person, but I honestly bookmarked all of them. 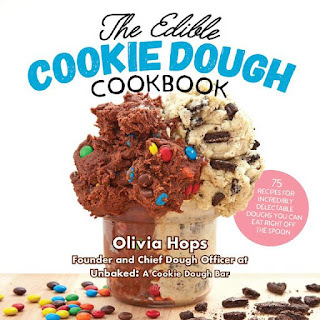 After she goes through her cookie dough flavors, she even includes recipes that use her cookie dough, such as layer cakes with cookie dough filling, cookie dough truffles, and cookie dough stuffed between baked cookies. Her suggestion to use cookie dough as a filling inside a layer cake really spoke to me. Soon enough, I was making a chocolate layer cake with Olivia Hops' chocolate chip cookie dough and a chocolate Swiss meringue frosting. The cookie dough came together quicker than I expected and tasted exactly like cookie dough. I enjoy cookie dough now and then, but as I said earlier, it isn't something I would snack on regularly. Especially this cookie dough, as it's mostly sugar and fat. That said, if you are a cookie dough lover, you will be over the moon. It even has the gritty texture that cookie dough normally has. It spread like a dream between my cake layers, and made a beautifully decadent filling. The cookie dough recipe made the perfect amount for a decent sized cake filling layer. 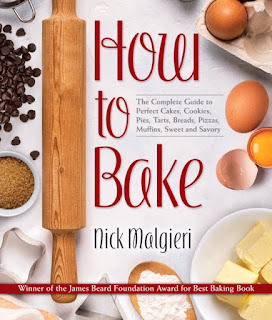 I'm excited to make more recipes in this book, especially the peanut butter cookie dough. I can imagine these recipes being a staple of girls' nights for my cookie-dough-loving friends or even a sweet gift for a friend, as Hops says most of the recipes should last two weeks at room temperature. The cookbook itself is fun, colorful, and bright. It's a pleasure to read and the perfect length. This is one of those books that I didn't know I needed until after I read it, but I would definitely recommend adding this to your collection if you're a fan of sweets.